This page will be under constant construction, just like my shop. When I was a little kid I wanted to someday be able to make anything that I could imagine. I don't suppose I'll ever get all the way there, but I have come a long way. My first interest is currently in metalworking, with blacksmithing having a slight edge. Second comes electronics and a close third comes woodworking. When I googled "my shop" recently, I almost decided not to even write this section because I saw some pictures of shops that were spotlessly clean. Mine will never look like those. Finally I did find some shops that at least looked a little worked-in so I decided to take the plunge. So, first I will Discuss some general design considerations,then my own shop goals, along with some philosophy. Following that heady stuff, I'll get into what my shops look like, how they were constructed and, finally, the contents of the shops. 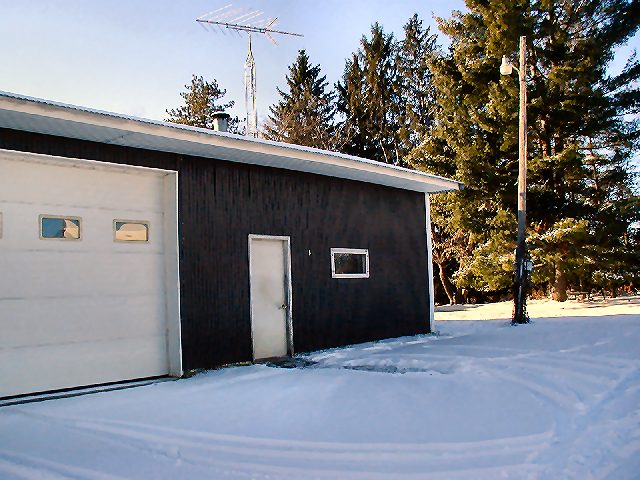 In addition to the shop building that I am about to describe, we have four other outbuildings where vehicles, stock and other machines are stored/maintained. These other buildings total about 5,550 sq ft. 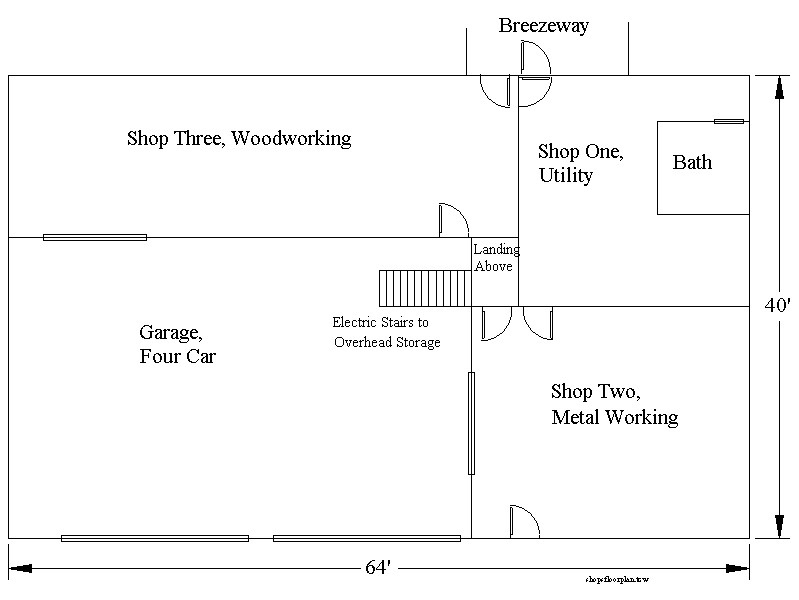 There are many aspects to consider when designing a "shop". I will attempt to cover all these topics as time permits. -No rusting of tools. This means that the temp/humidity must be kept below condensing. -Minimize "cold feet" We live in central Wisconsin, so we can expect nights of -30 degrees F.
-No shop is ever big enough. let alone "too big"! -Separate metal, wood and electronics areas. The dusts, particularly. -Connect shops to the home so I don't have to dress or shovel to get there. -Have shops positioned so they can easily support repair and maintenance of vehicles and things that others bring to me. -Have compressed air all over the place. -Have electricity all over the place. -Generate 3 phase power as needed so I can take advantage of cheap, used 3 phase machines. My shop building actually consists of three shop rooms and a four car garage. This building is 40 X 64 with 12 foot sidewalls. It is attached to our house by a 10 X 14 foot well insulated, heated "breeze-way". 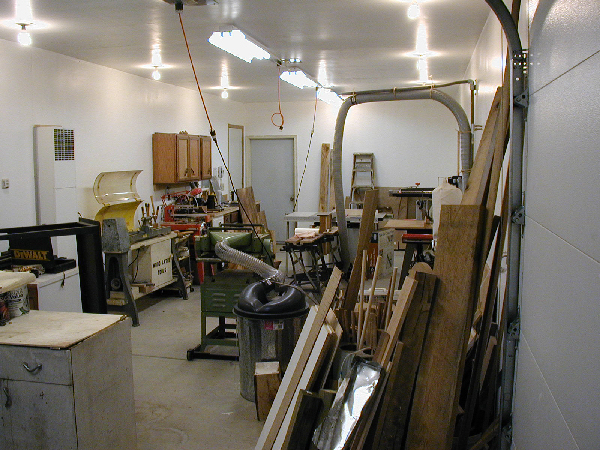 The first shop is 20 X 20 X 8 foot finished ceiling and is really a utility room/staging area for general use. It has a small electrionics bench and some storage capability. It contains a full bathroom and separate utility sink with floor drain. It is the only wet room I have out there. It has a 100 amp electrical service. This shop was built in 1978 when the outer building was constructed. My second shop is primarily my metal shop. The room is 20 X 24 X 9 foot finished ceiling. The southwest corner holds the blacksmith area and is roughly 10 X 8. Some Machine tools (8 X 20" surface grinder, 8 X 36" vertical mill, 15" shaper and 15" drill press) are located along the north wall. My 10" X 24" Atlas lathe and a wheel grinder are located along the south wall. The center of this shop is a sort of "common" area, and almost everything there is on wheels. The east wall of this shop has an 8 foot high 9 foot wide insulated garage door in it. This door is centered on the 20 foot long wall, with storage on either side. This garage door allows me to put a car or a tractor into the shop if needed, but primarily serves as the way I get machine tools in and out of the shop. It has a 100 amp service. This shop was added in 1986. The third shop is new in 2006. 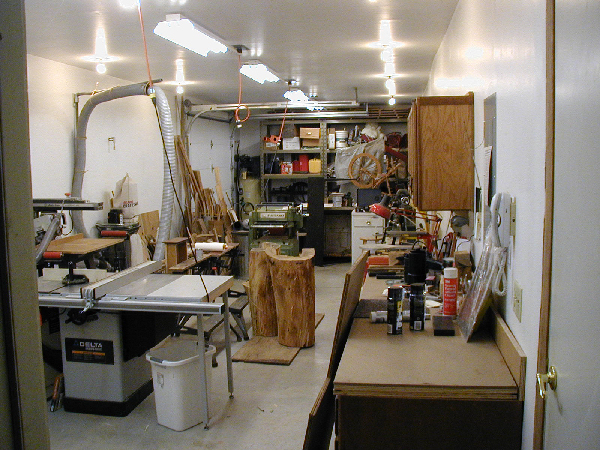 It is primarily a woodworking shop, although it also houses a 12" Atlas metalworking lathe. This shop is 13 X 43 1/2 with a 9 foot finished ceiling. Its long narrow shape lends it self to woodworking since the table saw, 36" band saw and 15" planer will be mounted in the middle of the floor so I can handle pieces of wood at least 8 feet long. This room also has an 8 foot high 9 foot wide insulated garage door in it. It has a 100 amp service. Shop one has a 4" thick mesh reinforced concrete floor of the normal kind, that is: 3000 psi concrete. It started to crack a couple of years after it was poured. The cracks can't go any place, but they are still there. The floor in shop two in six inches thick except for the northwest 1/4th which is 18" thick to support the power hammer and forge.All the way around the outside of this slab, 1" foam board is buried 2 feet deep to hold in heat. The concrete in this one is 4500 psi, rebar reinforced and surface treated. NO cracks in 19 years. The concrete in shop three and the whole garage floor are also 4500 psi, but these floors have rebar and fiberglass added. These floors are both 6" thick. In the case of shop three, the whole slab sits on 2" of high density foam and has 2" of the same foam 2 feet deep around all it's outside walls and 1" of foam between it and the garage slab. Another point of interest is that the garage floor sits one inch below the level of the three shops. This was done so that any water dripping off parked vehicles couldn't leak under the walls into the shops. This whole structure is a pole building. All the shops have 2 X 6 walls. Just inside the metal outer skin there is one inch of foam. Inside of this is 6 inches of fiberglass insulation. All walls and ceilings inside the shops are sheetrocked. Shops one and two use a ceiling system that supports 2 x 6's. With one inch of foam under the sheetrock and 6 inches of fiberglass, we get an R value of about 23. The ceiling is capped with 1/2" plywood and is used for storage. Shop three's ceiling uses 2 X10's for joists.It uses 10 inches of fiberglass and one inch of foam for an R value of about 33. Also capped with 1/2" plywood, it is used for storage too. A 35,000 btu propane counterflow wall furnace is mounted in the south wall of shop one. Although it primarily heats shop one and two, it has a heat vent into the breezeway behind it and that room never gets below 58 degrees. Shop two is heated with air flow through an open walk door between the two shops. With the thermostat set at 67 degrees, the coldest I have ever seen it in the northwest corner of shop two is 56 degrees. Shop three has its own 40,000 btu furnace of the same type as above. I have been in several shops heated with ceiling mounted furnaces, but they seem to leave the floor cold. This style of furnace called "counterflow" takes room air in from the top, heats it and then exhausts it at floor level. I am very satisfaied with this arrangement. Each shop has its own 100 amp service. Shop one has double duplex receptacles every 6 feet along the walls 4 feet above the floor. 240 is only used for a water heater in this shop. Main lighting is from 4 2X4 foot flourescent fixtures on one switch. Shop two has duplex receptacles every 6 feet along the walls and also one 6 foot plugmold strip with receptacles on 6 inch centers on the 3 continuous walls. It also has 50 amp 240 volt receptacles on three walls. In addition, it has about 10 hp worth of 3 phase 220 on 2 walls. At present that source (a home made auto start rotary converter) is used only to power an 8 X 20" surface grinder that takes 4.5 hp. Both shops have 140 psi air to most walls and this air goes out through shop two's east wall to supply the garage. Lighting is by 4 2X4 foot flourescent fixtures. One is switched by 3 way switches at both door ways and the other three are switched on as needed "task lighting". Shop three has double duplex receptacles every six feet at 4 feet height and single 50 amp 240 volt single phase receptacles every 10 feet. This holds true for the garage side wall, too. In addition, there are 4 recessed 12" square ceiling boxes positioned evenly from one end of the shop to the other. They each carry 120 volt lighting and also each has 50 amp 240 wired to it. The idea here is that I will put twist locks into each box cover and then make up pig tails as needed so I can supply any machines in the middle of the shop without tripping over cords. Also, each box is piped with 1" greenfield so I can feed them 3 phase power later when needed. Air for this shop is supplied by a separate 6.5 hp 175 psi 60 gallon compressor with a ceiling mounted 50 foot retractable reel. Air from this compressor also goes through the wall to the garage. Five 2X4 foot flourescent fixtures down the center of the shop are switched by 3 way switches at the walk doors as main lighting. There is a row of 4 2X4 flourescent fixtures on the ceiling along each wall. These sets are individually switched as task lighting. We use the covered space above all three shops as storage. To gain access, I installed a set of Hinged stairs made from 2 X 8's and 2 X 10's. They pivot at the top on the landing. At the bottom of the stairs I attached a 7 foot high arch that is raised and lowered by a 220#/440# Harbor Frieght hoist (in double line mode). The hoist is mounted close to the peak of the roof. 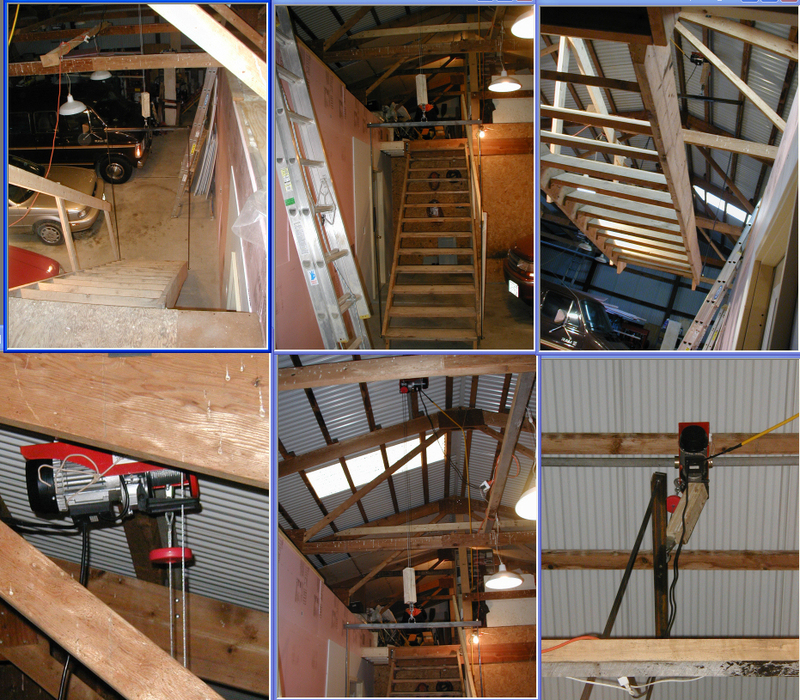 Here are some pictures of the stairway. I am sorry but its hard to get pix that show the stairway clearly. I call them my "Electric Stairs".! Email me if you have any specific questions. This shop has been in place since 1986. It seemed SOOOOO BIG when I was painting its interior walls!!! As of December 28, 2006, I can finally move in to this shop. Here it is, as empty as anyone will ever see it! As of January 6, 2007, I have moved in. Here it is, filling up fast! It's now late November of 2010. I've added some used kitchen cabinets, a dust collection system and a bunch of stock. Same date, looking toward the other end of the shop.